Know your customers' thoughts in a flash. 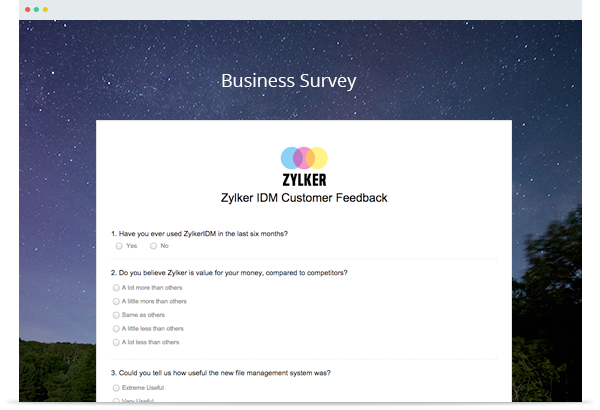 Create smart online polls, and have them launched in minutes, with Zoho Survey. Whether you need to know your customer's opinion on the product or service you just launched, or if you want to run a poll on a political campaign, or you simply love polling, Zoho Survey is the answer! We help you create online polls seamlessly and collect responses in real-time. Make the online poll short and crisp; it is the best way to get more responses. If you cannot think of appropriate questions for the poll, we are there to help you with ready-to-use question samples. Take care to edit them to suit your purpose, for the questions are the soul of your poll. Customize your online poll and make it look impressive. Zoho Survey has a wide gallery of themes and colors you can choose from. ​With a few tweaks here and an added logo there, you could have yourself a great poll with all your brand elements in it. Build your online poll and publish it in minutes. Publishing your poll is so much easier with Zoho Survey with our varied options to broadcast it. You can either embed it, ​send it via email, post it on social media, or distribute it through an email campaign. Being an online poll, your responses are collected immediately and reported cleanly. Real-time reporting, with custom, trend, and cross-tab reports, help you get to the bottom of every choice your respondents made near instantly. It's easy and simple! All you need to do is, sign up with Zoho Survey now and create your first poll.